The application process at Lonati Anglo-American School is very straightforward. Applications for admission are accepted and reviewed throughout the year. A student may be admitted to the school at any time during the school year, at the discretion of the Principal and in tandem with the school’s review process and according to availability. We encourage a personal interview and a tour of the facilities. We support student involvement in the admission process. We ask that families read the admission policy very carefully and apply to the programme as early as possible. What is the birthday cut-off date for entry? As a general rule, we place students in the grade appropriate to their age. Students are admitted based on the calendar year rather than the scholastic year. In what grade will my child be placed? LAAS considers the previous reports and school experiences of students admitted from other schools, in order that those students are placed within the most appropriate grade level. Previous school reports and records, as well as student's age, are considered when placing a student in a grade level. We look to see that a student has met the criteria for grade promotion in his/her previous school. We also evaluate students on the basis of meetings with the admission board and our own academic assessments. If additional educational support is needed to raise placement test performance levels, parents will assume all financial and educational responsibility. What is the class size and student/teacher ratio? LAAS offers smaller classes in order to support the specific needs and learning styles of students and to give one-on-one, personalized assistance. Yes, we keep an up-to-date waiting list for those interested in enrolling their student. Priority is given to families with one student already attending school at LAAS. LAAS’ academic week is Monday through Friday. The school day of Elementary and Middle School begins at 8,30 am (9,00 am for Early Years). Kindergarten students can be dismissed at 3,30 pm. Middle School students enjoy Flex Time, and may be dismissed at 3,30 pm on certain day(s) of the week (with parental permission). All other students are dismissed at 4,15 pm. Is Italian language taught at LAAS? Yes, beginning in Transition (4-5 years old) and continuing into the final grade of Middle School. My student does not know English or Italian. Is this a problem? In Elementary, LAAS supports English and Italian as an Additional Language (EAL/IAL) learners with specialized assistance. Within the Middle School, new students must have competency within English in order to successufully complete the courses. Middle School students new to Italian are given IAL assistance. Why is Chinese offered at your school? LAAS offers Chinese within the Elementary. Our students enjoy learning an interesting language and studying and exploring a vibrant five-thousand-year-old culture. 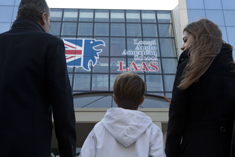 LAAS is an internationally-minded school and embraces a global and forward-thinking outlook. Why is Latin offered at LAAS? Latin is incorporated into the last grade of Elementary and offered in Grades 7 and 8. The course encourages students to begin making linguistic and cognitive connections with the history and culture of the Roman past and Western civilization, as a whole. What curriculum does LAAS offer? Elementary: LAAS provides a curriculum based on the International Baccalaureate Primary Years Programme, a curriculum framework used in thousands of schools internationally. Seen as a legitimate alternative to state or other private schools, IB schools are continually recognized for their innovative educational point of view. The IB focuses on international-mindedness and the development of the whole student (academically, emotionally, physically and socially) and the skills and special character attributes required of a twenty-first century learner. Middle School: The curriculum is based on the research of international curricula made by our educators. It is articulated and aligned in a graduated learning continuum across the grade-levels. Our curriculum is routinely examined and reviewed and serves as the firm foundation of our assessment, recording and reporting practices and procedures. What about after school clubs? From Monday to Friday (3,30 pm - 4,15 pm) a school club is provided to students in Early Years, where Kindergarten and Transition students enjoy a number of interesting activities and experiences. Each Friday, from 3,30 pm to 4,15 pm elementary students enjoy an after school club featuring different activities, games and surprise visitors.